CycleOps' highest model in this line, the 400 Pro Indoor Cycle can easily duplicate the demands of a cross-country race or a serious ride. The technological end result of over ten years of research and development in its category, the 400 Pro combines the wishlists of cyclists of all levels into one revolutionary indoor cycling machine. Indoor cycling doesn't have to mean a loss of adrenaline. The 400 Pro lets you relive that epic ride any day of the week, rain or shine. Features include the ability to control target power, slope or gearing with dedicated resistance control, PowerTap technology for +/-1.5% accurate power feedback, and the Joule™ 3.0 computer system, which offers three modes of performance training: dashboard, reports and activities. 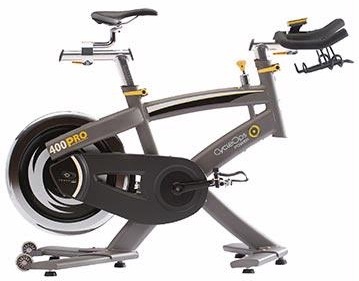 Buy CycleOps Pro 400 Indoor Cycle - FREE SHIPPING! This fascinating piece of fitness equipment has all the best things about the models that came before it. This includes the ability to condition everyone from expertly trained cyclists to amateurs who use it to get fit in their spare time around the house. The stable platform ensures that no matter how hard you ride, or how tumultuous the programs settings you create, the bike will remain stable, reliable, and last for a lifetime. It’s freewheel motion makes it so that at any time users can coast, catch their breath, check out the data on the console, take a drink, and then get back into the workout. The construction is so modern, and ensures that people get not only a truly effective and efficient workout or training session, but don’t risk injury in the process. PowerTap technology makes it a sinch to use and abuse, with a +/-1.5% accuracy rating in terms of feedback.